The success of the two first Big Bang Ferrari watches in 2012 is already inspiring new models! 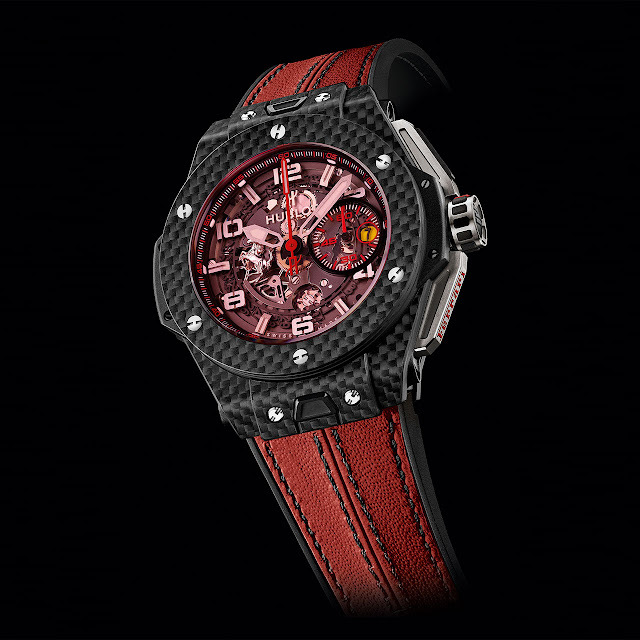 Three timepieces are to join the extremely select circle of this cooperation between Ferrari and Hublot, including the Carbon Red Magic. With a case and a movement – named the UNICO – entirely designed, developed and produced at Hublot, this watch is the symbol of the brand’s progress towards vertical integration. It boasts a wealth of performance, including a reliable and robust Flyback chronograph function distinguished by the original positioning of its double coupling-clutch mechanism and the famous column wheel visible on the dial side. The equally impressive carbon fibre case is built on a multi-layered principle that avoids bubbles and thus enhances its resistance. Finally, the mass of the red sapphire crystal was coloured directly during its making, thereby guaranteeing its unalterability. Mechanical automatic, Manufacture UNICO HUB 1241 calibre, 330 parts, 28,800 vib/H, 72-hour power reserve; beadblasted and satin-brushed black oscillating weight shaped like a Ferrari wheel rim.